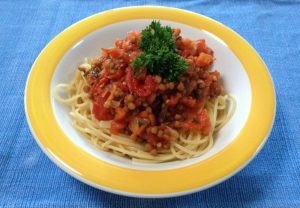 Cook lentils, drain and place aside – guidance on cooking is provided below. Or drain and rinse canned lentils. Finely chop onion and leek (see tips on preparing leek below). Heat the oil in your cooking pot, on low heat, add the onion and leek. Cook until the onion is soft and stir in crushed garlic. If you are using dried herbs, add them now too. Stir the mixture well to heat and cook the garlic without burning it. Add tomatoes and cooked lentils. If using fresh tomatoes also add ½ – 1 teaspoon sugar. Cooking time will be 15 – 20 minutes for fresh tomatoes and 10 minutes for canned tomatoes. If you are using fresh herbs, add these 5 minutes before the end of cooking. Wash lentils to remove any grit and then drain. Place the lentils in your cooking pot and cover with water. Bring lentils to the boil and simmer lightly for 35 – 45 minutes. You may need to top the lentils up with water during cooking. One cup of dried lentils will require 2 – 2.5 cups of water for cooking. As a meat substitute, allow for 175 – 220g cooked lentils per person. The larger serve is recommended for people eating a vegetarian diet. Dried herbs have a more potent flavour than fresh herbs. To obtain a similar flavour, use 1 teaspoon dried herbs in place of 1 tablespoon of fresh herbs. Cooking sequence is also altered when using dried ingredients. Dried herbs are added closer to the beginning of the cooking; where as fresh herbs are best added within the last 5 minutes of cooking. A good way to prepare the leek is to remove the outer layer, rinse in cool water, slice off the roots, cut off the very green tough ends of the leek greens and then slice the leek in half lengthways. The outer layers of the greens can now be easily separated for additional rinsing under cool running water. Place the cut side of the leek downwards on the chopping board and chop crosswise along the leek (so you end up with a number of semi circles). Great substitute for a favourite meat based pasta dish — it is hard to spot or taste the difference. Comes with the nutritional benefits of little saturated fat (some from the olive oil). Great source of dietary fibre (8g dietary fibre per 100g cooked lentils). Less expensive than the meat alternative. Lentils are a key to healthy longevity.